Detailed season accounts, photos, statistics and much more information about the Solent Stars Basketball Club. Steve Fitzsimons stood down to become Assistant Coach for this season. He was replaced as Head Coach by American, Jim Kelly. Kelly, with Harry Smith's financial backing and Sperring's sponsorship, set about strengthening the squad that had finished fifth in the previous season. Most of the existing squad returned, although Ken Walton had retired. Mark Saiers, TJ Robinson, Tony Watson, Karl Tatham, Paul Philp and Roy Lewis were the core of the previous team. They were joined by John Johnson, a 6' 4'' Manchester-born but American-educated guard who had at one time been drafted by the Boston Celtics. He had spent two years with Crystal Palace whilst they tried for English citizenship before joining Solent. Another new signing, from Warrington, was 6' 6'' forward Mike Griffiths. Making up the squad were Dave Wilson, Ken Heathcote and Paul Cummings. Solent opened the season with a friendly fixture against Hemel Hempstead. After the comfortable victory over Hemel (103 - 64) the Solent Stars further boasted their pre-season build up with wins over Racing Club of Paris (82 - 80) and Le Hans (110 - 90) during their three day tour of France. On returning to Fleming Park on September 10th, Solent played against The University of San Luis Obispo to win a fourth pre-season match (90 - 79). Three league victories were then recorded over Bolton away (134 - 87) and home wins over Liverpool (84 - 80) and Bracknell (100 - 86). On September 29 Solent played the first leg, at home, of their first round European Cup Winners Cup match against Hatrans, Holland. John Johnson scored 30 points as Solent beat their opponents 78 - 71 but the main question was could they protect that lead in the return leg, the following week. In between, Solent travelled to Manchester to win 93 - 68. In front of 3,000 fanatical Hatrans supporters, Solent set out to protect their slender first leg lead. Karl Tatham had an inspired game and with Saiers and Watson controlling the boards and TJ Robinson scoring 34 points, Solent had the pleasure of seeing the home fans streaming out before the end of the game, which they won 95 - 83 to proceed to the next round. Two convincing home victories followed over Bolton (109 - 83) and Kingston (108 - 79) before Solent entertained Crystal Palace in a TV league game played on specially supplied carpet. It was the carpet that took the blame for Solent's first defeat (71 - 85) of the season. The pace of the game was slowed down and both teams had to adjust to outside shooting rather than driving through the defence. Solent were soon 14 points behind and never able to recover. Solent then had to travel to Sunderland for a tough game that they won (87 - 80) with Paul Philp picking up the plaudits for a fine performance off the bench when Sunderland had reduced Solent's lead to just a point at one stage. Solent met Belgian opponents in the second round of the European Tournament, Maccabi Brussels. Thanks to a splendid second half performance in the home leg, Solent took an 88 - 58 result to the second leg. Maccabi had no answer to Solent in the second leg in a match largely boycotted by their own fans and Solent won again (65 - 61) with Dave Wilson scoring the final basket. Solent had prepared for the return leg with a comfortable home win over Doncaster (100 - 80) and cup action followed for Solent on their return from Belgium in their next match, an ASDA National Cup game - against Watford (119 - 82). One of Solent's most exciting games of the season followed when they went to Kingston. Solent's points advantage at halftime proved to be difference between the teams as they fought out an even scoring second half to win 92 - 88 and keep the pressure on league leaders, Bracknell. Hemel Hempstead were Solent's next victims (114 - 81) before the ASDA National Cup quarter-final home game against Kingston. The visitors came still smarting from the defeat ten days earlier and an ill-tempered match ensued that Solent killed off by taking a 27-point lead by halftime. Solent completed their third win over Kingston (124 - 79) with Robinson notching 35 points. A match on Thursday evening in Birmingham proved a mixed trip for Solent who won easily 118 - 93, but lost Mark Saiers in the process, when he was taken to hospital following a clash with Neville Hopkins. He was available for the game two days later at home to Leicester. However, the Solent team - carrying several injuries - lost out on the night to Leicester (62 - 64) when they were unable to make up the 20-point deficit that built up just after halftime. Johnson scored half the Solent points. Following this defeat Solent had to go to Crystal Palace to play the return league match, having lost the earlier home game by fourteen points. With five seconds remaining, Solent were leading by two points and had possession of the ball in the hands of Karl Tatham. Under intense pressure he lost the ball and the Palace scored to level the game at 82 all. In overtime Solent scored the first six points to put the pressure on their opponents. Solent avenged their earlier defeat with a 94 - 88 win. Solent's coaching team - Steve Fitzsimons (left) and Jim Kelly. Jim Rumsey can be seen at top right. A trip to Bracknell followed for Solent. Paul Philp was captain for the night to mark his 200th National League appearance. With five players reaching double figures Solent were able to run out winners (96 - 81), although Dan Callandrillo stole the scoring honours with 41 points. From Bracknell, Solent made the trip to Cologne, Germany to play Saturn in the European Cup Winners Cup. Solent Stars put up a real fight before going down 61 - 74 to the German team in a game full of ill feeling. Back in National League action Solent took on high-riding Liverpool and although winning by five points (75 - 70) they were only one point ahead with ten seconds left in the game. Rules at the time meant that teams could choose possession instead of shots and coach Kelly had taken that option as Liverpool committed a host of desperation fouls. Away to Brighton, Solent had an easier ride to triumph (98 - 61) after a very good first half. 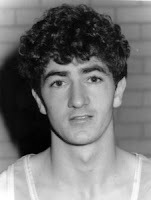 Brighton's leading scorer was Alan Cunningham (19). Just two weeks after their league meeting, Solent this time played host to Crystal Palace in the first leg of the semi-final of the ASDA National Cup. Once again feelings ran high as the teams matched each other point for point in the first half until a final flurry of six points just before the break gave Solent a 39 - 33 halftime lead. John Johnson gave a display of accurate shooting to score 33 points as Solent won the second half by a similar margin to take a 12-point advantage for the return game. Solent then went on to play their fourth match in five days when they travelled to Milan to play Cymac in the Cup Winners cup. In front of 15,000 fans Solent fell 2 - 8 behind after five minutes but staged a fine rally to lead 45 - 20 at halftime. Although Milan fought back in the second half Solent were able to hold on and win 67 - 61. As they left the stadium, a window in the team coach was broken as disconsolate fans threw stones. The week finished for Solent with a home game over in-form Manchester. Again, the Solent team was triumphant (99 - 82). Only one match remained before the mid-season break - the second leg of the ASDA National Cup semi-final. A very tired Solent squad took to the TV carpet floor to defend their 12-point advantage. The Solent chairman Harry Smith sent in an official protest at the inclusion of Mick Bett in the Crystal Palace team. Mick had returned from the USA on holiday whilst studying there. In the event Solent only lost by four points (69 - 73) and so moved on to the final - to be played at the Royal Albert Hall in January - against Leicester Riders. Solent then went to Belgium to take part in the Sunair Tournament, losing to the hosts 84 - 85 in a televised game and followed that with a 89 - 96 defeat by French champions Limoges to finish fourth in the tournament. League action was resumed with a win at Birmingham Bullets (83 - 77) prior to the January 7 ASDA Cup Final date at the Royal Albert Hall. The final was given extra spice by the fact that Leicester was one of only two teams to have beaten Solent so far in the season (62 - 64 at Fleming Park). 700 tickets were sold to Solent fans for the sell out final which was also screened on Channel 4. After building up an early lead (8 - 10) in the fifth minute, Leicester were only able to add four more points in the next ten minutes as Solent soared ahead 33 - 14. For the rest of the match, Solent were content to keep the comfortable points gap. Despite a better performance in the second half by Leicester, Solent were never in trouble and captain, and Most Valuable Player, Mark Saiers lifted the trophy at the end of the game - a third success for Solent. Johnson was top scorer with 20 points. Two days later, it was back to European action at Fleming Park and the visitors were unbeaten Cibona, Zagreb. With a squad that included seven players who were 6' 7" or taller, Zagreb were able to win the rebounds on a night when Solent did not shoot well. Trailing 32 - 53 at halftime, Solent reduced the lead to nine points at one time in the second half, but eventually were defeated 77 - 92. The following weekend was equally taxing with two away matches. Kingston were beaten 74 - 64 before Solent took part in a close encounter with the improving Brighton for whom Alan Cunningham scored 20 points. After leading 39 - 36 at halftime, some crucial baskets by John Johnson saw Solent home 79 - 74. Another two days passed and Solent were again at Fleming Park in European action, this time against Saturn, Cologne. Neither side was able to establish a lead of more than six points as they matched each other throughout the game. The German team lost two of its starting five who fouled out shortly before the end. Coach Jim Kelly persevered with just five players in the second half. Solent won 82 - 78 to set up a chance to get through to the last four of the competition. Just one game separated the two European games - a home game against reigning champions, Sunderland! However, Sunderland were going through a lean spell and Solent were in no mood for charity as they defeated their opponents 99 - 83 with Johnson scoring 30 points. Cymac (Billy), Milan were the next visitors to Fleming Park. They had recently had a shock win over group favourites Zagreb. With five minutes remaining the teams were locked at 64 all, but Solent were missing the power and determination of Tony Watson, who had twisted an ankle in training on the Monday prior to the game. Although replacement Mike Griffiths had an excellent game, he could do nothing as Solent tired in the last five minutes to lose 68 - 78. An away league game against second to bottom Doncaster proved an easy outing for Solent who won 98 - 62, prior to setting out for Yugoslavia to face Zagreb. A win of 16 points was needed to go through to the final stage, but Zagreb - having lost to Cologne, also - needed the win to be certain of going through. Tony Watson was still out through injury and to make matters worse, Solent had a 26-hour fog-bound journey before they arrived in Zagreb, just six hours before the game. Solent's seven players achieved a remarkable win on the night 86 - 78 (Johnson 26, Robinson 22) but the margin was insufficient to take them through to the last four. Two games in two days immediately on their return from Zagreb posed more difficulties for Solent. At home, against Crystal Palace, a purple patch in which they outscored the visitors 11 - 0 in two minutes was the deciding factor in Solent's 82 - 71 win. A trip to Manchester followed and it was a game in which Mike Griffiths distinguished himself despite - or as the Echo reporter wrote - maybe because of a five-minute absence with concussion. He scored 22 points in the 102 - 86 win. Back at Fleming Park on the Wednesday of the following week, Solent overcame Hemel Hempstead 111 - 95 and extended their three month unbeaten league run. Solent faced two away games on the following weekend. Against Ovaltine Rebels, Hemel Hempstead, Solent had little difficulty in repeating their win of four days earlier, this time 104 - 87. The Monday televised game was against Sunderland and because of surprise weekend defeats for their closest rivals, a win would give Solent their first ever League Championship. The dreaded TV carpet was again in use and Solent's apprehension was justified since their only two defeats had been in 'carpet' matches. However, a competent performance in which Solent left no opening for the home team in front of a full house, saw Solent lift the Championship with a convincing away win (90 - 73). For some reason the Solent team were not invited to the post match reception, despite having won the league, but the Sunderland players were - and promptly went down with food poisoning! The unlucky team to come to Fleming Park as Solent paraded the trophy at their next home match was Doncaster. An overconfident start left Solent trailing by five points with three minutes of the first half remaining. Jim Kelly gave a halftime pep talk that resulted in a better second half performance which led to a 111 - 81 win. The signs of tiredness displayed at the Doncaster game were manifest when Solent took on Brighton (home) and Warrington (away) within 24 hours. Brighton matched Solent's scoring throughout and in the end Solent had no response to Brighton's final burst and lost 93 - 101. Solent also looked lethargic the following day and when TJ Robinson hobbled off in the second half they could not keep pace with the home team and lost 75 - 81. In the first half of the next game, at home to Leicester Riders, Solent - without TJ Robinson and Roy Lewis - looked to carry on in the vein of the two previous games, and were trailing by two points at the halftime buzzer. An inspired start to the second half - when they prevented Leicester from scoring for four minutes - saw Solent return to winning ways (81 - 63). Confidence was restored even more with a trip to league basement club Bolton, when Solent scored their highest league total of points in a 125 - 96 win. Then was a return match at Leicester on the Monday and Solent came through, in front of 3,000 Leicester fans, in the closest of games (74 - 72). John Johnson, Karl Tatham and Tony Watson were selected for the Great Britain Olympic squad, as the season drew to a close. An extraordinarily exciting game took place at Fleming Park, when Bracknell were the visitors. Anxious to reach the play-offs, Bracknell threw everything at Solent in front of a packed house. A fiery last 25 seconds was played out as Solent led by just one point when Dan Callandrillo latched on to a Karl Tatham mistake, but to no avail. The final score of 78 - 77 in Solent's favour bears witness to the tense ending. 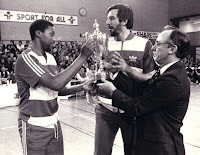 It was at this game that the presentation of the League Trophy by the EBBA President, Ken Charles, took place. At the final home game, another presentation took place. This time it was the Player of the Year Award given to John Johnson. To celebrate Johnson then went on to top score in the match with Birmingham scoring 29 points in the 110 - 88 win. Having already played 51 matches in the season, Solent now moved to Wembley to play in the League Championship Play-offs. The semi-final game was against Bracknell and - as two weeks before - it was a close game with Solent in control but only winning 83 - 81 after a determined last ditch effort by Bracknell. In the final, Solent were up against surprise winners Warrington, who had overcome Crystal Palace. Another close game ensued with a potential match-losing blunder by Karl Tatham in the last minute not being punished by Kevin Penny who missed an easy lay-up. Solent held on to win their third trophy, 70 - 64. John Johnson received the Most Valuable Player of the Season award. A controversial end-of-season tournament followed in Scotland. The event was billed as the British Championship and included eight teams from England, Scotland and Wales. The EBBA tried to ban Solent from competing - they thought it would devalue the Championship Play Off competition. Solent disposed of hosts, Falkirk, 76 - 67 after coming through the first game against Glasgow 75 - 74. This set up a final with Murray, Edinburgh. Solent were always in trouble once Tony Watson left the game in the fifth minute with concussion and TJ Robinson quickly ran into foul trouble. This was Solent's 56th competitive match of the season and they could not match the fresher Murray team and lost 73 - 84. This blog contains the complete history of the Solent Stars Basketball Club. Use the labels to select the season or topic you wish to view.